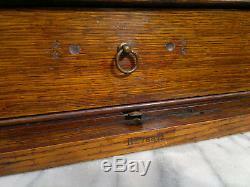 C1880 Victorian Safe Smokers CabinetTiger OakDesktop Stationary Box? 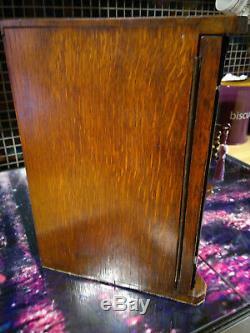 Measures 11.75"across and 12.5"tall with a depth of 9. 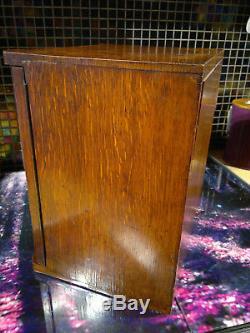 Superb double door Victorian oak smokers cabinet in the form of a bank safe which would make a great desktop stationary box or similar. Has registration patent number "Rd 76871"below bottom drawer and "Rd 56159"on lock mechanism. 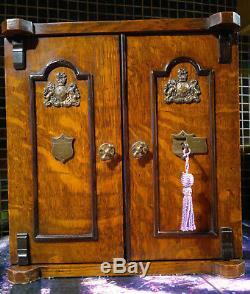 Could be wall mounted or left free standing as is. 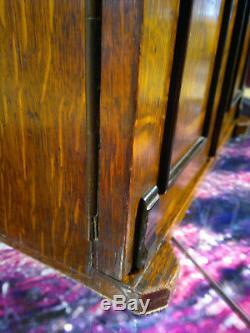 In very good usable antique condition, great character, well made with a great warm patina showing through. Nice size which will go just about anywhere with a wide range of uses. Will display well in any period or contemporary setting. Doors and drawers open and close fine. Though is not original but does lock and unlock okay. 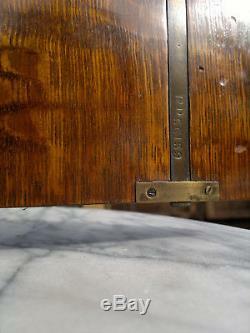 There is some age related marking on the cabinet as you would expect from around 140 years old. 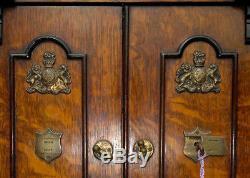 Has odd old repairs/restoration on ebonised strip on right door. The back has a couple of cracks... Probably age related shrinkage with a little warpage. The bottom drawer has a pull ring on and not a handle the same as the other two. 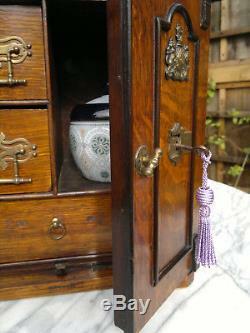 Comes with antique tobacco jar. 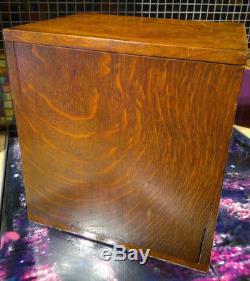 All nothing major, but noted and does not detract from this quite rare smokers cabinet. There are age related marks, scuffs, wear etc, etc. Has wear and tear commensurate with age and use. Weighing around 6.714 kilos!! 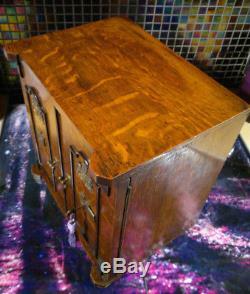 Unwrapped, solid well made quality antique piece. Please VIEW All photos and ZOOM for TRUE COSMETIC CONDITION. As this forms part of the description.. And do please Check out my other items. Be sure to add me to your. Items are packed very well with extreme care is taken to ensure you receive goods in perfect condition. All UK items will be posted'signed for' or Economy "tracked". All parcels over 2 kg are posted with Parcelforce Global Priority Express. In order to keep my P&P costs as low as possible I may use recycled packaging materials. 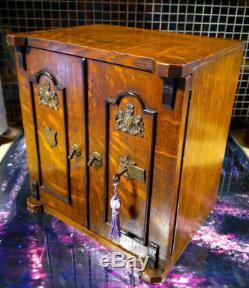 The item "C1880 Victorian Safe Smokers CabinetTiger OakDesktop Stationary Box" is in sale since Monday, June 18, 2018. 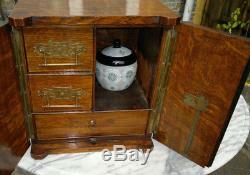 This item is in the category "Antiques\Antique Furniture\Cabinets\Victorian (1837-1901)".